~ Culinary Adventures In & Out of the Kitchen. Recipes, Reviews, Culinary Musings. 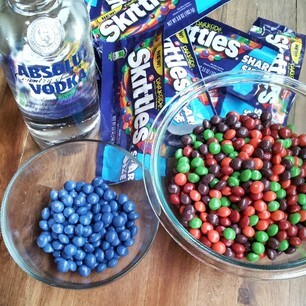 It’s not every day that the Allrecipes.com video team searches for Skittles candy at 8:30 am. We were, however, on a special assignnment to make the Video for the Beast Mode Vodka to celebrate our local football team ~ Seahawks! Do I admit that I don’t watch football? Do I admit that to me, “football” still means “soccer”? Do I admit any of this? Perhaps, I do not. Instead I will admit to how fun it was to separate 9 large bags of Skittles Darkside candy into the Seahwaks blue and green colors. 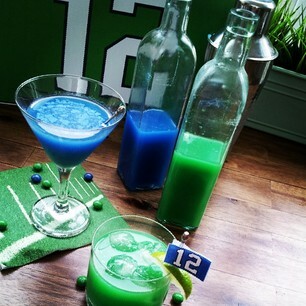 If you are a fan of Seattle Seahawks and want to make this flavored vodka to cheer during the game, do follow the recipe. If you happen to cheer for a different team, you could use a different color of Skittles to match.